The same is true at Defense. James Mattis looks from this distance as the best of Trump’s cabinet appointments and the one likely to get through the confirmation process most smoothly. It could be months — or hell, who knows, more than year — before he has a full cadre of senior officials to help him run the department that spends about half of the entire Federal discretionary budget. Right now, as at State, there’s not a single deputy, assistant or under secretary appointment out there. He can have coffee with the Secretary of the Army, once that confirmation goes through, but while that’s undoubtedly a significant post, just about everyone a SecDef needs just to stem the torrent of decisions that department needs made every day isn’t even on the radar yet. Trump’s going to redo trade deals around the world? Who’s going to do the talking? At least Commerce has a deputy secretary nominee, but again — no one else is home. Modernize the nuclear arsenal? Governor/Secretary Perry, all by his deeply – nuclear – competent lonesome? When it comes to policy, Trump will be only a vague presence in the executive branch during the months when presidents normally have the best chance to get things done. [link in the original] It’s not news to anyone that bureaucrats are skilled in resisting the preferences of presidents. But an entrenched bureaucracy against a secretary (and in most cases, a secretary with little government experience or little policy expertise or both) and a bunch of empty desks? That’s no contest. In some ways this is all a tiny bit of a good thing: when if we have to confront malice, may it be incompetent and all that. I don’t take too much comfort there — I’m sure the Republican Congress will do all they can to ensure that policy, once Trump’s executive branch knows where the bathrooms are, will be just as awful as can be. That it may take a bit longer to get there is a good thing, but not hugely so. So: two cheers for any no-show-derived reprieves from the worst of Trumpismo. None at the thought of the Ferret Heedit Shitgibbon faced with a real-time response to more or less anything with his non-existent administration there to help. *It’s a slightly tricky number. For one thing, since 2011, almost three hundred positions that require confirmation can get it through a streamlined process, and the number above omits those. For another, people don’t seem to be sure exactly how many appointments still have to go through the full megillah. The Washington Post says 660, for example, while Bloomberg News goes with 690. Hence my split-the-0difference number above. ***That’s all fifteen members of the cabinet, three ambassadors — to China, Israel and the United Kingdom — the US Representative to the United Nations, a deputy secretary (Commerce), the Secretary of the Army, Medicare’s assassin the Administrator of the Centers for Medicare and Medicaid Services, the Deputy Attorney General, the Adminstrators of the EPA and the SBA, the trade rep, the director of OMB, the CIA and Office of National Intelligence Directors, and the SEC chairman. 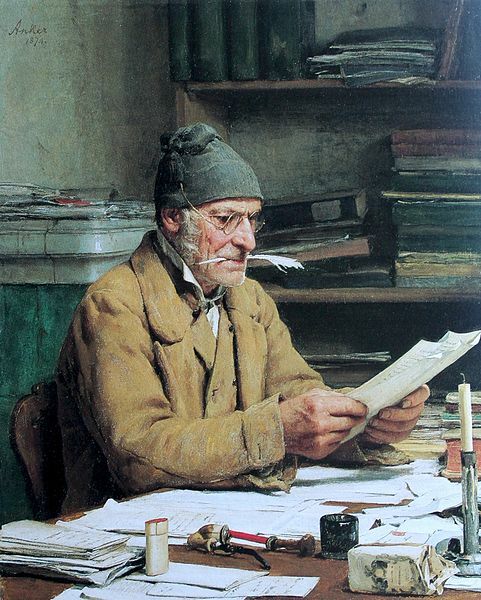 Image: Albert Anker, The District Secretary, 1874. Explore posts in the same categories: Foreign Policy, Republican knavery, Stupidity, Uncategorized, Who thought that was a good idea? This entry was posted on January 20, 2017 at 5:19 pm and is filed under Foreign Policy, Republican knavery, Stupidity, Uncategorized, Who thought that was a good idea?. You can subscribe via RSS 2.0 feed to this post's comments. As you’re doubtless aware, but I just learned, there is now a very active group working to get scientists into politics. It’s needed now more than ever in our lives. I’d wanted some means of turning despair into motivation, and I think I’ve found it.